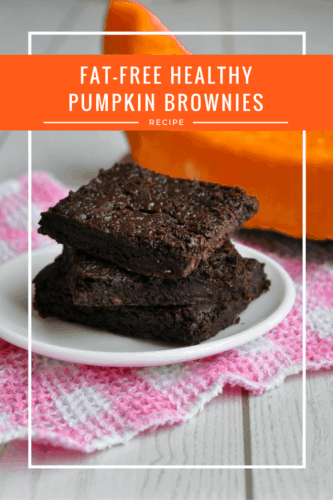 If you think the best brownies in the world are melt-in-the-mouth gooey and fudge-like, loaded with intense chocolate flavor and so moreish you won’t be able to stop at just one, you’re going to love this fat-free healthy pumpkin brownies recipe. Inspired by my one-bowl healthy pumpkin brownies, this recipe is perfect for chocolate lovers looking for a seasonal fall dessert recipe to mix things up a bit. I decided to make another healthy pumpkin brownie recipe after I found out how much some people don’t like eggs! My one-bowl healthy pumpkin brownies recipe is one of my most popular and loads of people were asking what they could use instead of eggs. I love eggs and would happily eat them for every meal every day of the week if I wasn’t worried that my cholesterol levels would shoot through the roof if I did. So after the shock of realising some people aren’t quite as egg-happy as I am, I came to to the conclusion that the people who were requesting an egg-free version probably didn’t have something personal against eggs. I’m sure they wanted to omit them to keep calories/fat down or because of allergies. So to make sure no one is left without a mouthful of rich and fudgy chocolate brownie, I’ve developed an entirely egg-free and fat-free version. And you know what? It is beyond delicious! I’m always amazed at the fantastic results you can get by switching out butter or oil for a healthy vegetable puree. This method works amazingly in my fudgy vegan avocado black bean protein brownies and it works just as well in this recipe. Actually, I’ll go as far as to say it works even better because while you can definitely taste the avocado in the other recipe, you can’t taste the pumpkin at all in this one. This makes it great for anyone who’s trying to get their friends and family to eat better. Sometimes you just know someone won’t even try a mouthful of something if you tell them it’s got veggies in. My boyfriend is the perfect example. In fact, he’d probably run out of the house. 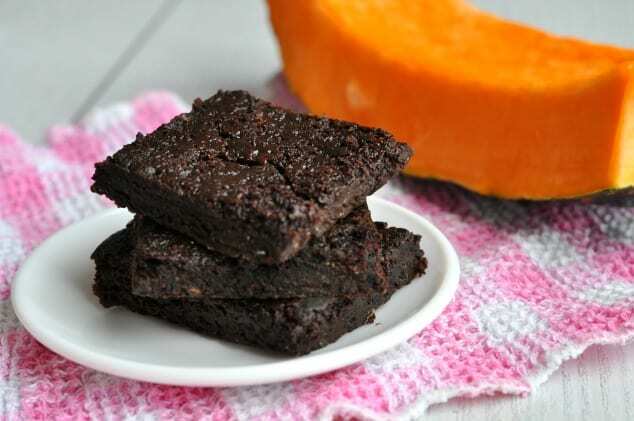 But if your recipe testers knew just how important pumpkin puree is in this fat-free healthy pumpkin brownies recipe, I’m sure they’d make an exception. It keeps the brownies incredibly (apologies in advance, I know some of you hate this word!) moist, rich and fudge-like. And, as well all know, these three things are key to making the perfect brownie. Preheat the oven to 350F / 175C and line an 8" / 20cm square baking pan with parchment paper. In a medium-size bowl, stir together the vanilla, coffee, water and pumpkin puree. Stir in the sugar, flour, cocoa powder, baking soda, baking powder and salt. Tip the brownie batter into lined baking pan and bake in the center of the oven for 25 minutes, until the edges and the top of the brownies are just beginning to develop a crust, but there's still a bit of wobble in the middle. Remove the brownies from the oven and leave to cool in the pan on a wire rack before slicing into 9 servings. Wrap the brownies individually in plastic wrap and they'll store in the fridge for up to 1 week or in the freezer for up to 6 months. 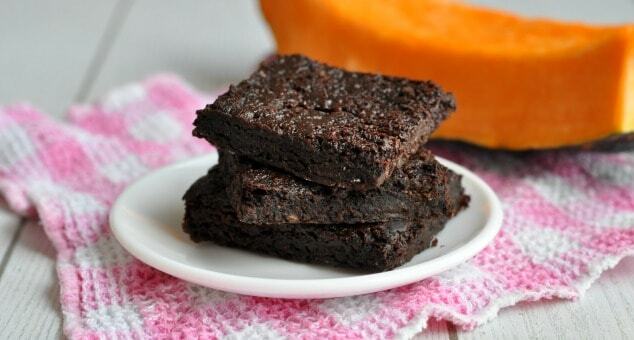 These brownies are incredibly high in vitamin A (each one contains 42% of your RDA). They are low in saturated fat and contain zero cholesterol. 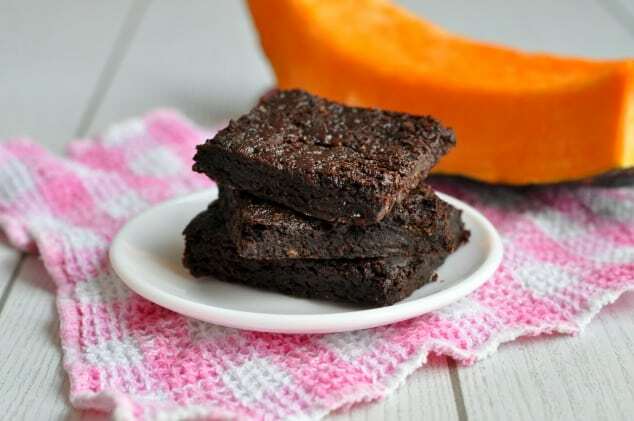 You know 1/9th of this fat-free healthy pumpkin brownies recipe totally counts as one of your 5 a day, right? I’m being serious! So go forth, eat brownies and feel good about it! Gotta love any pumpkin recipe that is healthy! These brownies look delicious! Love this eggless Brownie recipe! I try to bake egg less as much as possible and this recipe looks so easy to make! Fat free? No way. What a perfect, healthier way to get my daily chocolate fix! A healthier way to get my brownie fix?? Love it! They look good! I am all for adding extra vegetables to bakes to make them healthier. These look super fudgey. These look soooo fudgy and delicious! YUM! I love anything with chocolate + pumpkin.